The weather picked up a bit on Saturday afternoon but it was still quite dull. I decided to pop out and take a few pictures before it got dark. I had promised myself to come back to the bridge I crossed a while back and make some image s of the stream, so this seemed the ideal opportunity. There is a bit of a walk from the road to get here so I didn't stop to take many photos on the way. The overcast sky allowed me to slow the shutter speed down on a lot of the shots so that the moving water would take on more of a silky texture. I didn't get too far down the valley before I reached a waterfall where the valley sides were very steep and dangerous. As it was getting dark I headed back up the valley and took a few extra shots. This first shot is of the bridge and was taken hand held but most of the later shots were taken on a tripod because of the long shutter speeds. 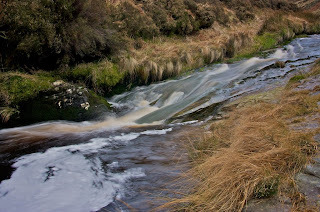 This second photo it a little way down the stream at the bottom of a small stretch of rapids. The water hits the pool and creates some swirling foam in the water. There are quite a few other pictures from the day in the Streams album on my gallery site. I've given up struggling to use the web publishing software that came on my iMac because it was stopping me getting the enthusiasm add any new galleries. The problem was that it seemed to insist on publishing the whole site every time I added anything. I stopped using it for my blog a while back for the same reason. Don't get me wrong, the website it created was very good and slick to use for visitors but when it was taking me nearly to hours to upload it I got pretty fed up. You couldn't even leave it because the ftp connection would time out. Anyhow my daughters partner suggested using a system called Coppermine and I found that my hosting company supports it so I thought I'd give it a try. I've started with some photo galleries of reservoirs and I am working my way backwards through my photos and will add more shortly. So far it seems quite good and I'm looking forward to putting lots more of my photos out for veiwing. Here's a link to my new gallery and my old gallery is still around for the moment bu I will eventually transfer the church photos to the new gallery. 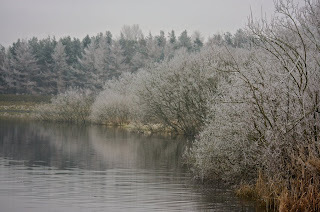 Hope you like the new gallery and please post some comments, I'd like to know what you think. ... and I'm intending to keep the blog up to date from now. I can't guarantee how long I'll keep it up but it's a new start. I'm also intending to update my website more often but at the moment that is more of a task. I'm considering changing to a different program for creating the website and I'm looking for something that will make creating photo galleries a bit less time consuming. So the weather hasn't been great for the last few days and freezing fog seems to have set in for the rest of the Christmas and New Year break. Had a heavy night last night with a large quantity of red wine so it took some time get started today. 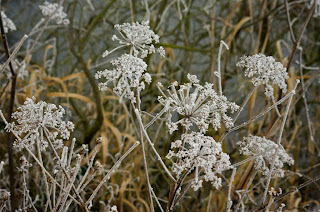 It was well after 2pm before I left the house and ittooke me a while to find somewhere to make some photographs. 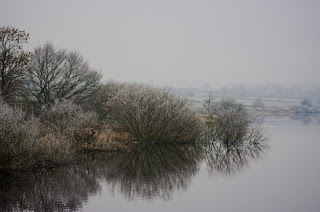 I had intended to go to the reservoir near the Fountain Inn at Ingbirchworth but it seems that everyone else had the same idea and I don't like to have lots of people in my photographs so I decided to go to the nearby Royd Moor reservoir instead. 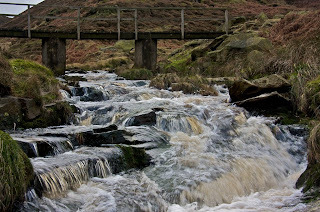 When I got there I found that the footpaths had been closed because there was some work going on at the reservoir. So I ended up moving on to my favourite Scout Dyke reservoir further down the road. Even here I found that part of the footpath around the reservoir was closed off for work being done. By now it was heading fast towards 3pm and I thought I'd better get out and get some photos taken before it got too dark. Also I had my daughter dog with me and she was getting a bit restless in the back of the car. I'd just brought my telephoto lens with me because I didn't want to bring much with me so no wide angle shots today. 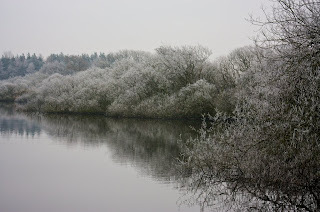 The trees and grass all had a coating of frost and there was a bit of ice the edges of the reservoir. This first photo is looking down the reservoir from the damn wall. 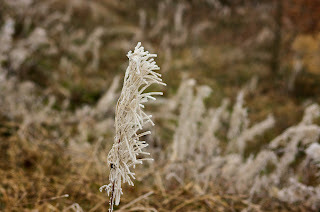 As I walked around the reservoir I made a few photographs of the frost covered grasses and weeds along the path. The next photo is looking back towards where the first photo had been taken so is showing the same edge od the reservoir from the othere side. Again looking back down towards the damn wall from much further around the reservoir. 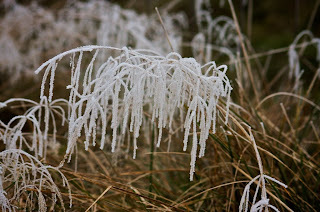 Another couple of hots of the frost covered weeds and grass. Towards the top end of Scout Dyke there is a path that goes up towards Royd Moor reservoir so I followed it for a while. I could see where they were working on the outlet channels from the reservoir but it was all fenced off. It was starting to get darker (it had never been particularly light all day) so I headed back towards Scout Dyke. 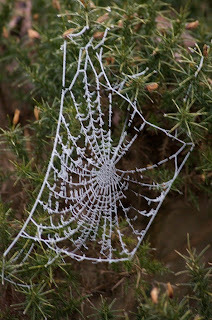 On the way back I spotted this frozen spider web. The photo is a bit shaky but I had the camera on its highest sensitivity, with the aperture wide open but the shutter speed was still one twentieth of a second. This lens doesn't have any vibration reduction on it so at 149mm I should have been aiming for around a one hundred and fiftieth of a second. Perhaps I should have used the flash but I try to avoid it if at all possible. Last photo from back at the damn wall. 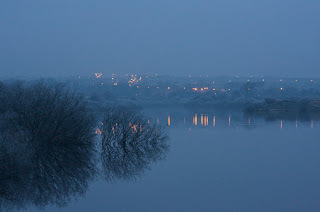 By now it was almost dark and this shot is showing the lights from Ingbirchworth reflecting on the water. 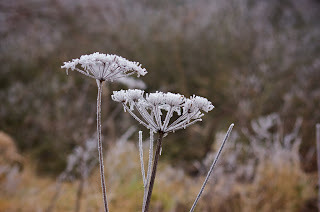 I hope tomorrow will be a bit brighter and maybe I can get out and make some more photographs.